Slingshot Hip-Hop is a documentary film directed by Jackie Reem Salloum, the American- Arab film activist featuring the Hip-Hop lives of Palestine. The Documentary captures the moments of various hip-hop movements in Palestine who struggle to resist against the Israeli occupation of their land with the weapons of rapping and hip-hopping. The 127 minutes documentary featuring Hip-Hop teams like DAM, PR (Palestinian Rappers), WEH, MWR was released on January 2008. This stimulating documentary in its main plot portrays the story of three aspiring Palestinian musicians from the rap group DAM. Through their narrations, the film tells about the struggles and sorrows of Palestinians, and their difficulties in day to day life under the merciless occupation by Israel. The documentary starts with the meeting of DAM trio with the legendary Hip-Hop artist Chak D. The meeting with Chak D, the first man to produce political hip-hops was really important as far as they were concerned. They remember this meeting as short as a dream. 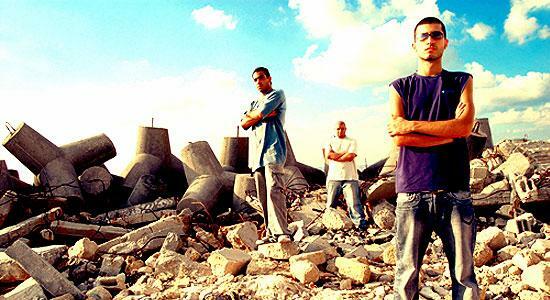 The legend speaks them and asks them about the status of Palestinian hip-hop. Suhell says Hip-hop was their CNN borrowing the words of Chak D.
After this meeting, director takes us to the room in Lyd, in the present day Israel from where the family of Tamar and Suhell lived. Suhell says to the spectator “At the initial stages only music was in our minds. Gradually we shaped our politics as we have to find a way to unite the people, Palestinians and pro-justice groups for the cause of a free and fair nation. And we had to give our people hope and confidence in the midst of ongoing ruthless attacks by the Jewish state. We were influenced by the rap groups including Tupac, Snoop, B.I.G, Gangsta Rap, Nas, and Atmosphere, Mos def, Big Pun and so on. Tamar says that people told that they were like Public Enemy. And he didn’t know who it was. Once he got the music album titled Public Enemy and then he was embarrassed and wonderstruck. Taking the DVD of Fear of a Blck Planet Tamar says Israel feared an Arab nation within their boundaries. Palestinian hip-hop is by and large indebted to the contributions of great thinkers and writers like Edward Said, Mahmoud Darwish, Malcolm X, Handala, Naji Al-Ali, Ahlam Mestaghanmi, Naval Al-Sadawi, Hanan Al-Sheik, NIzar Qabbani and many more. Thus Tamar breaks DAM as of 30% hip hop music, 30% literature and 40% Palestine. Tamar’s parents were originally from Jaffa, a major Palestinian city. They became refugees like 80% of the entire Palestinian population when Israel was established in 1948 by the conspiracy of the colonial powers, i.e. the British Mandate from 1920-1948 tearing Palestinian society apart. They found asylum in Lyd on 1950. Now, going back to their motherland is a dead dream for them. The camera goes through the ghettos where Palestinians live without the very basic necessities. All the areas were closed in by checkpoints. Police and soldiers were patrolling there. Loads of nonsenses like, there was an elementary school that was replaced by a police station as they got no other place for that. All that area was slated for demolition. No Arab got permission for building a shelter so that no Arab will expand or build on that land. Government placed boulders to block the expansion. There were no lights, no mails, not even addresses. People went for 10 days without water and at times there was no electricity. The place was like a refugee camp in Israel. It was hard to believe that the place was only 10 miles far from the affluent city of Tel Aviv. Living in Jewish state, as minority they became strangers in their own country. Things grew worse when Israel took over West Bank and Gaza in 1967. Since then 67’ Palestinians have lived under the occupation. They can’t leave West Bank and Gaza without special permission from Israel. And there was a giant wall between the territories. It created mental and physical separation between the people as well. This was their story in Lyd. And Slingshot Hip-Hop tries to tell the story of breaking down this bridge by the union of various hip-hop movements and artists throughout Palestine and Israel. Tamar came to hip-hop on 1999 while he was 19 years old. He concentrated only to develop his music skills like every artist. He wanted to be successful in his music. He was the first official Arab rapper. Later his younger brother Suhell and mate Mahmoud joined Tamar in his ventures and formed DAM. They were thrilled that they were doing something different among the deeply disappointed Palestinian youth. He never rapped about the hips and politics though he knew deep inside the drug problems in Lyd was tied with politics. They didn’t discuss politics as they knew that if they do they will be screwed and finished. But everything changed in 2000 when the violence in the region was escalated and Israel demolished the sites. Who is terrorist? I’m the terrorist!? How am I a terrorist when this is my home land? Who’s the terrorist? You’re the terrorist! Go to the law? What for? And what are my options? Who the hell are you to tell me how to behave? Asking me “where are you going”? You seem to forget where you came from. Films tells the history of each bands how they came to the music and its revolutionary application. On several occasions director speaks to the audience either as Tamar or Muhammed. The scenes from the refugee camps at Ramallah where Tamar and his team give the kids, boys and girls instructions and guidance about hip-hop and other resistant lessons are really striking and emotional. They all uphold their identity as Palestinians who are suppressed by an unjust enemy. The rappers call for their brand new resistant movements as the situation in Palestine grows bad to worse. The disappointed Palestinian society, especially youth who are isolated like prisoners are turning to self-destruction becoming addicts to drugs. They haven’t found happiness under the tanks of Israel for too many decades. Documentary develops through the telephone conversations and chatting between the rappers from various corners of Palestine. Muhammed Fara of P.R becomes immense inspiration for other rappers as he conducts their maiden hip-hop show in Gaza under tight security and police siege. After a series of efforts to arrange a platform to meet each other, DAM gets permission to conduct a show in Ramallah with P.R. Their trip to the meeting place has been captured superbly. Unfortunately the scheduled meeting was spoiled by the ruthless Israel army who blocked P.R from reaching to Ramallah. Tamar applaudes P.R and urges a wonderful, huge gathering to encourage the rappers of P.R. After the darkest days, P.R gets an opportunity to meet DAM guys and to conduct a joint Hip-Hop show in West Bank. The documentary ends with the emotional get together of these unusually courage and talented rappers in Palestine. Their struggle for a free Palestine will continue with all vigor and power. Let us salute them. Hope and confidence in their words are immensely high. The government blocks our path, we’re still counting bodies. This is our life in Lyd. We are under fire; they will try to crush us. We will stay on our feet, Living for today. Our future is in our hands! There is still good in the world, my brothers.